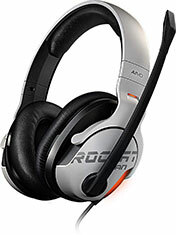 The Khan AIMO represents a gaming first with its exclusive Hi-Res audio compatible surround sound. Adding a top-end virtual 7.1 headset to the AIMO series, it boasts a premium hardware spec with its powerful driver units and built-in high fidelity sound card. 50mm drivers with robust diaphragms deliver rich 7.1 audio with precision and clarity, letting you locate sounds flawlessly.